Yes, I know, that title is a bit of an oxymoron. There is no real Iron Throne. It doesn't exist. I made it up. I said it was made of melted swords, but really, it was made of words, like all such fictional constructs. Ah, but it's real to me. That's part of what it means to be a writer. If you don't know what I'm getting at there, go read my old short story, "Portraits of His Children." When I write about the Iron Throne, I SEE it in my head… and I try to describe it as best I can. Not being a blacksmith or an ironmonger, however, I hammer it together with words, striving to make all of you, my readers, see what I see. Most of the time that works… though, as the recent brouhaha about the Red Viper shows, the picture in the reader's head and the picture in the writer's head do not always line up perfectly. With the Iron Throne, however, the process has been particularly frustrating. 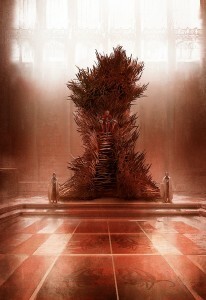 A dozen different artists have done versions of the Iron Throne over the years. Some have been very striking, some less so, but none of them have ever been quite RIGHT. Their versions never quite matched what I saw in my mind's eye. Then came the show, and HBO's version of the Iron Throne. 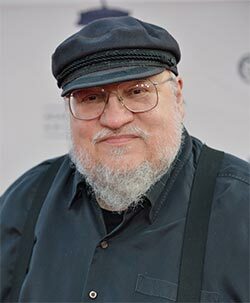 I'm a realist about these things, and I know perfectly well that for millions of television viewers worldwide, the HBO Iron Throne is THE Iron Throne, and always will be. It turns up everywhere, on book covers, on magazines, in places that have no connection to the show. Say "GAME OF THRONES," and people think of the HBO Iron Throne. And, hell, in some ways the HBO throne is more real than mine could ever be. They've actually MADE theirs (though it is not actually made of iron). There's the one that sits on the set in Belfast's Paint Hall, and at least six others that travel about the country making promotional appearances at conventions, screenings, exhibits, and the like. They turn up in train stations and parks. Thousands of people have had their pictures taken sitting on the Iron Throne, including many celebrities. And me as well, many times. Over in the UK, Sky Atlantic has their own Iron Throne, that also travels about to help promote the show. Canal + has one too, in Spain. The Spanish and British thrones are variants, somewhat different from the HBO throne, yet similar in most important respects. I've been seated on both of those at well. The HBO throne has become iconic. And well it might. It's a terrific design, and it has served the show very well. There are replicas and paperweights of it in three different sizes. Everyone knows it. I love it. I have all those replicas right here, sitting on my shelves. That's the Iron Throne as painted by the amazing Marc Simonetti (and if you haven't gotten his 2013 Ice & Fire calendar, better hurry, the year's half over) for the upcoming concordance, THE WORLD OF ICE & FIRE. It's a rough, not a final version, so what you see in the book will be more polished. But Marc has come closer here to capturing the Iron Throne as I picture it than any other artist to tackle it. From now on, THIS will be the reference I give to every other artist tackling a throne room scene. This Iron Throne is massive. Ugly. Assymetric. It's a throne made by blacksmiths hammering together half-melted, broken, twisted swords, wrenched from the hands of dead men or yielded up by defeated foes… a symbol of conquest… it has the steps I describe, and the height. From on top, the king dominates the throne room. And there are thousands of swords in it, not just a few.